Prominent & Leading Manufacturer from Mumbai, we offer dehumidifier air handling unit, single skin air handling unit, air handling units and double skin air handling unit. 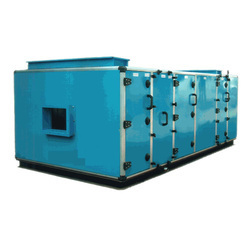 We are the leading and prominent Manufacturer, Exporter, Trader and Supplier of Dehumidifier Air Handling Unit. 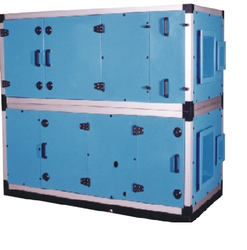 We are the leading and prominent Manufacturer, Exporter, Trader and Supplier of Single Skin Air Handling Unit. 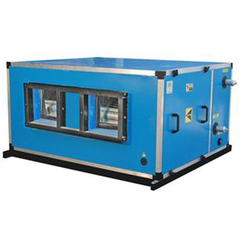 Our Air Handling Units is manufactured with the latest advanced technologies and high quality raw materials. These ranges of products consist of blowers blower section with krugger make forward curved DIDW centrifugal high static, siemens/bharat bijlee/crompton make three phase induction motors, mixing box section, coil section with direct expansion type cooling coil, driving accessories, insulated condensate tray, filter section with 20 micron and pre filter mounting frame, return air and 10%f. A. Cut outs. Construction: the frame is a hollow section which is manufactured from aluminum. The whole unit consists of galvanized sheet skin casing which is 40 mm puf installed with extruded aluminum frame work. A minimum of 40 kgs of polyurethane is sandwiched between outer and inner sheet. Drain tray is fabricated out of 18g s. S sheet with the required slope to ensure quick removal of condensate. Motor and drive: motors are of 415±10% voltage, 3ø squirrel case, 50hz and are fully enclosed. These products are specially designed for low noise operation and the drive to fan is managed through belt drive arrangement. Fan: the fan is krugger make forward/backward curved DIDW centrifugal high static blowers. Heavy gauge galvanized steel is used for housing and the fan impeller is mounted heavy ball bearings and solid shaft. The pulleys, impellers and fan shafts are dynamically and statically balanced. 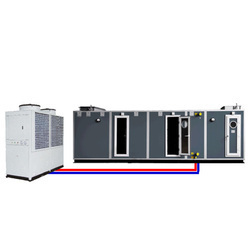 The Double Skin Air Handling Unit consists of blower section with KRUGER make forward curve DIDW centrifugal high static blowers, SIEMENS / CROMPTON make three phase induction motors, driving accessories, coil section with direct expansion type cooling coil; insulated condensate drain tray, filter section with 20 microns and pre filter mounting frame, mixing box section, return air & 10% F.A. cut outs. The fan assembly mounted on the common base with vibration isolator, flexible canvass connection. The AHU frame should be the aluminium hollow section with 25mm thick PUF insulation (outer skin CRCA & inner skin G.I.) with enamel finish. Provision of service doors in the blower and mixing box section wherever required and the doors and panels will be sealed with the food grade rubber gasket in order to avoid air leakage.